I was about halfway through Animal, Vegetable, Miracle by Barbara Kingsolver, and I had already read about eating locally, avoiding GMOs, and how much fossil fuel was involved with most of our produce. Then she wrote about local cheese, and how she attains it: her husband makes it in their kitchen. A year previously, I had expressed my desire to learn cheesemaking, and my husband vetoed it. He claimed it smelled. So I put the dream off, until I had a conversation with my older sister about Indian paneer. I made the paneer out of 2% milk and some lemon juice, then used it in palak paneer with some of my spring spinach, and was delighted with the ease and success. Within a few weeks of that, I started to read Animal, Vegetable, Miracle. 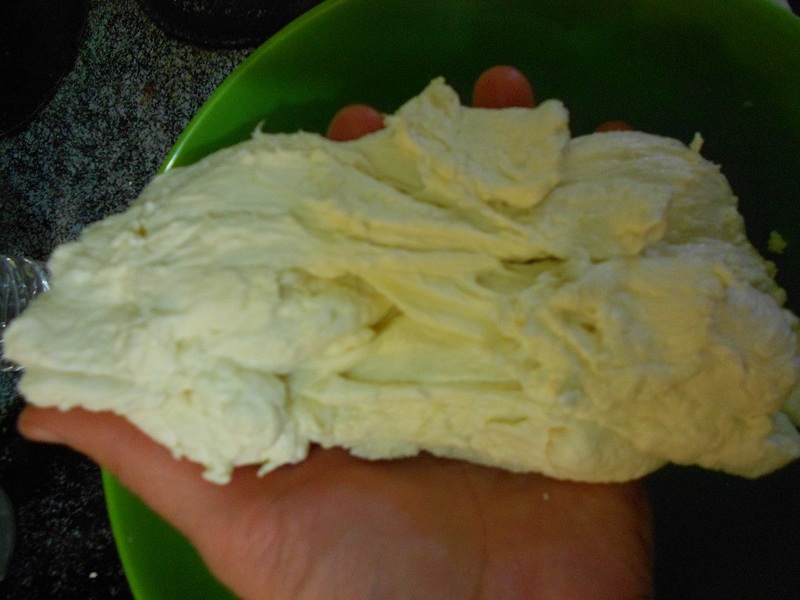 When Barbara Kingsolver gave the recipe for 30-Minute Mozzarella, I told my husband that he was wrong. I would be making cheese, whether he liked it or not. This has since evolved from paneer, to mozzarella and ricotta, then feta and fresh curds, and now to the 3-month cheddar that I cut into last week. So far, no smell. And yes, he is now totally on board with my cheesemaking efforts. 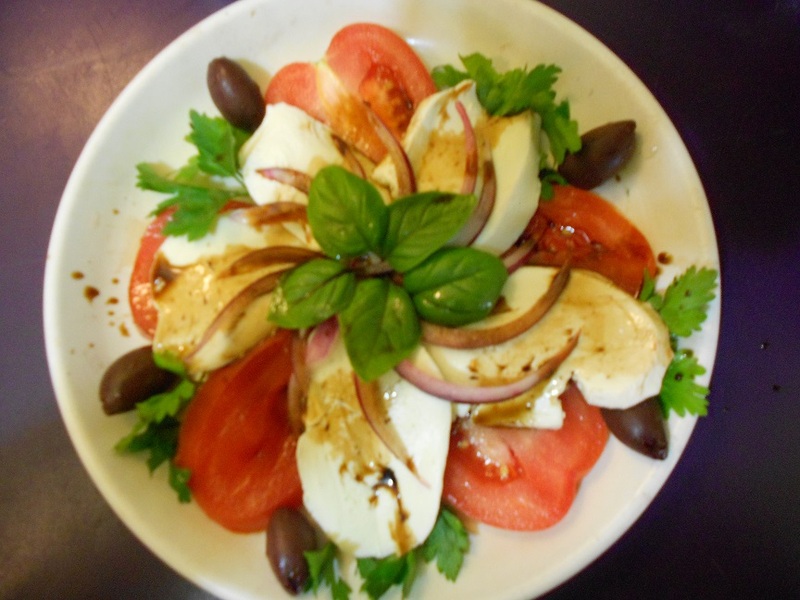 Of all the cheeses, mozzarella is the quickest and easiest. A few weeks ago, my husband wanted pizza and the local pizzeria was packed with customers. We walked home, and I kneaded up some crust dough. While the dough rose, I made the pizza sauce and the cheese. It was finished in time to toss the dough and load up the pizza. Not all of these are used at the same time. Do not use Junket. Turn the burner onto medium-low while you prepare the other ingredients, occasionally stirring the milk gently. If you garden or compost, keep the milk jug. I’ll explain later. Left: vegetable rennet. 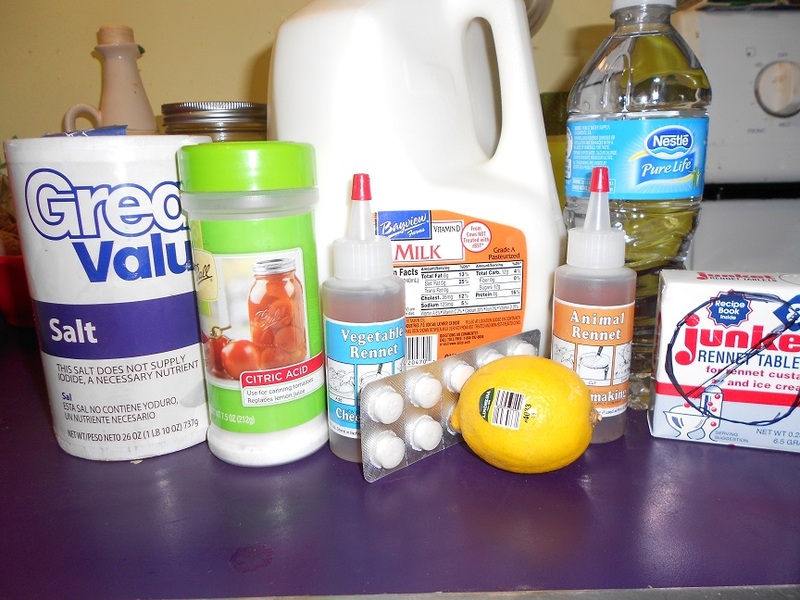 Right: citric acid and lemon juice. Do not add both acids to the cheese! The photo is only to show both. 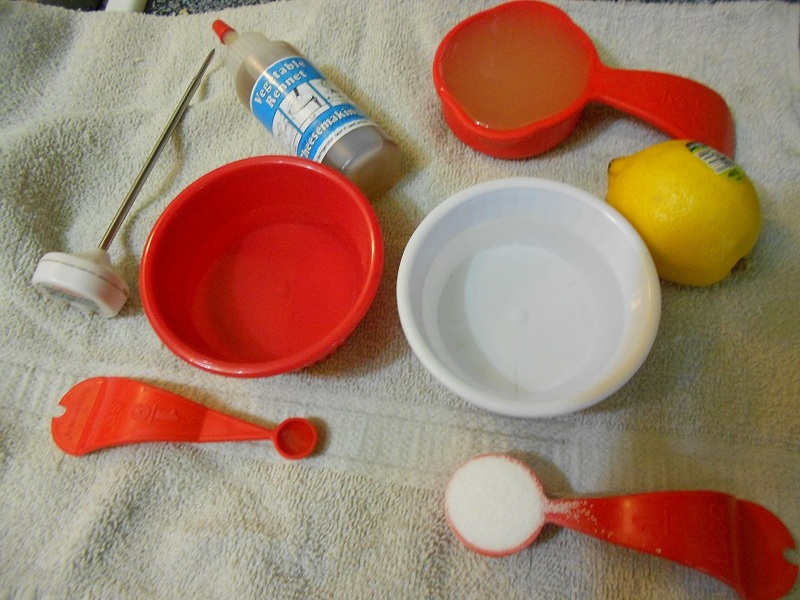 In two separate cups, measure out ¼ cup non-chlorinated water into each cup. Chlorine affects the curdle, so if you have municipal water, you might want to use bottled or distilled water. I use white and red prep cups for this, so I don’t accidentally add the ingredients in the wrong order. Into one cup, dissolve either ½ Tbsp of citric acid, OR add 1/3 cup lemon juice. I find citric acid in the canning section at Walmart, and it’s not even $3 for an entire container. You can also find it at some health food stores, or on Amazon. Because of my sister’s dietary intolerance to citric acid, I made this recipe with lemon juice instead. When the milk reaches about 88 degrees, you should see it curdle. Add the rennet at this temperature, even if you only have a little bit of curdle. Again, stir gently. If your milk has not curdled at all, check the carton to be sure you didn’t use ultra-pasteurized. Allow the temperature to rise just above 100 degrees. 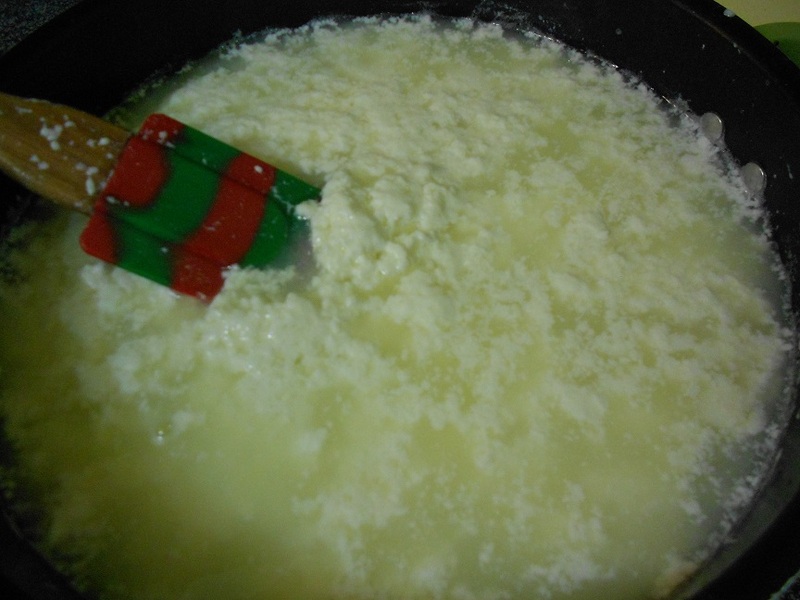 In that time, you will see the curds separate from the clear, yellowish whey. Remove the pot from the heat. 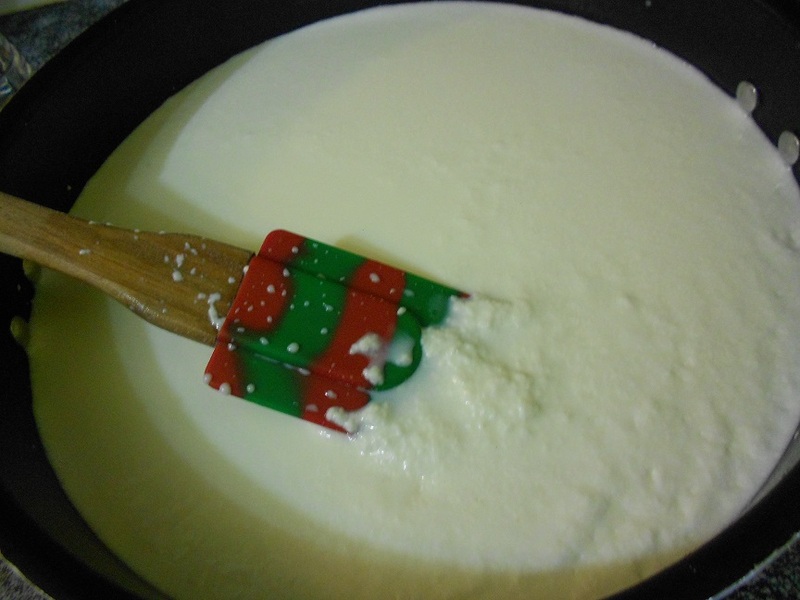 With a slotted spoon, lift the curds from the whey and put them into your microwave-safe bowl. 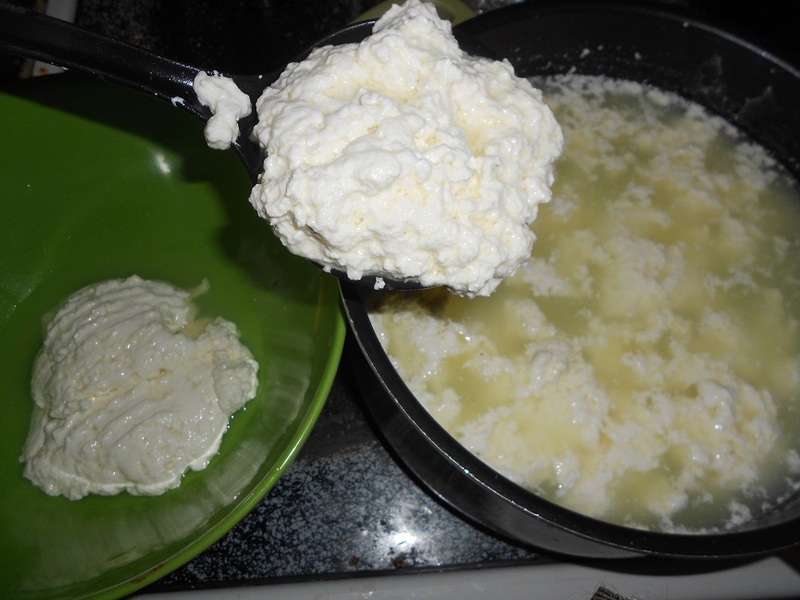 Try to drain as much whey out of the curds as you can. You can also run the whey through a sieve or a cheesecloth to catch all the curds. I always save all of my whey. Acid-loving plants like tomatoes thrive on whey. It’s great to balance out compost. My chickens love it. Some people use it as a base for vegetarian soups. I just funnel it back into the milk jug and set it in the fridge for later. Gently press as much whey as you can out of the curds, and pour the whey off. Set the cheese back in the bowl and microwave on high for about a minute. 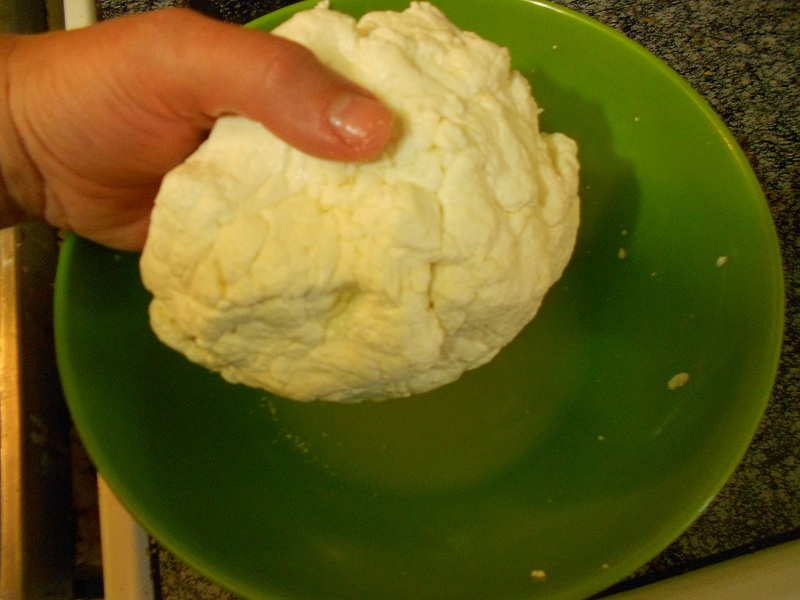 Knead and press the curds to release more whey. 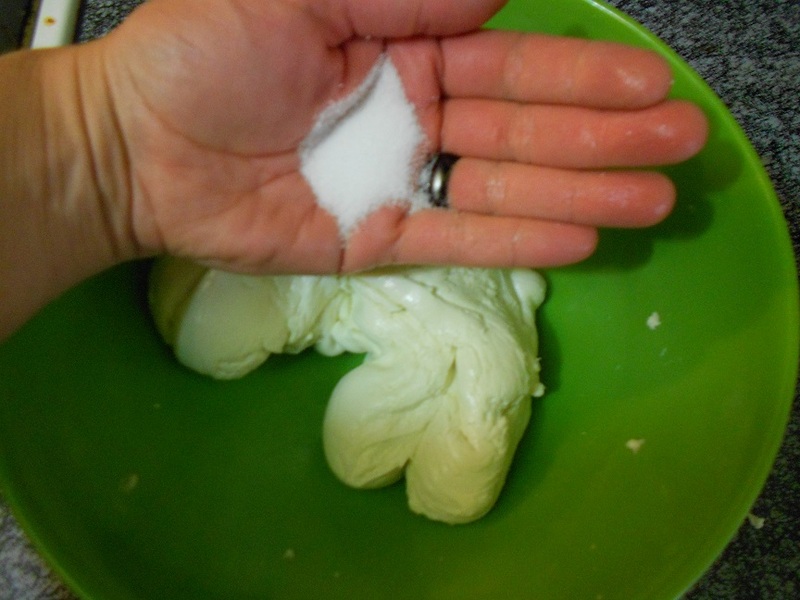 Squeeze all the moisture you can out of the curds, and set them back in the bowl. Microwave the curds for 30 seconds. 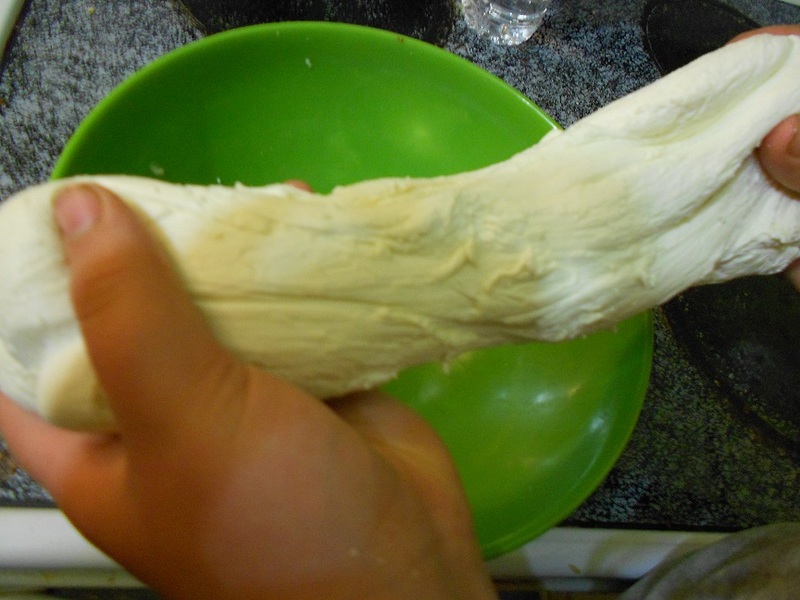 Knead the curds, stretching it and folding it over itself, as if you were making taffy. When the curds start to break, microwave it for another 30 seconds then knead again. Be careful: this can get hot! Rubber gloves may help. This is a picture of curds breaking, because they aren’t heated enough. The strings will snap into jagged-looking edges. When this happens, microwave another 15-30 seconds then knead again. Heat and knead 3-4 times, until the cheese is smooth and stretchy. You’ll probably notice it has taken on the texture of string cheese. There’s a good reason for that. It is string cheese! Add enough salt to taste. I use about a tablespoon. Save this step for the very final knead, because the salt interferes with the stretch of the curd. Using non-iodized salt can help retain some stretch. Heat and knead the dough until the salt is well incorporated. Your cheese is done! Now you can either pull it into string cheese, roll it into little balls, or roll it into a big ball for slicing/grating. If you plan to use it soon, immerse it in ice water to solidify the curd. 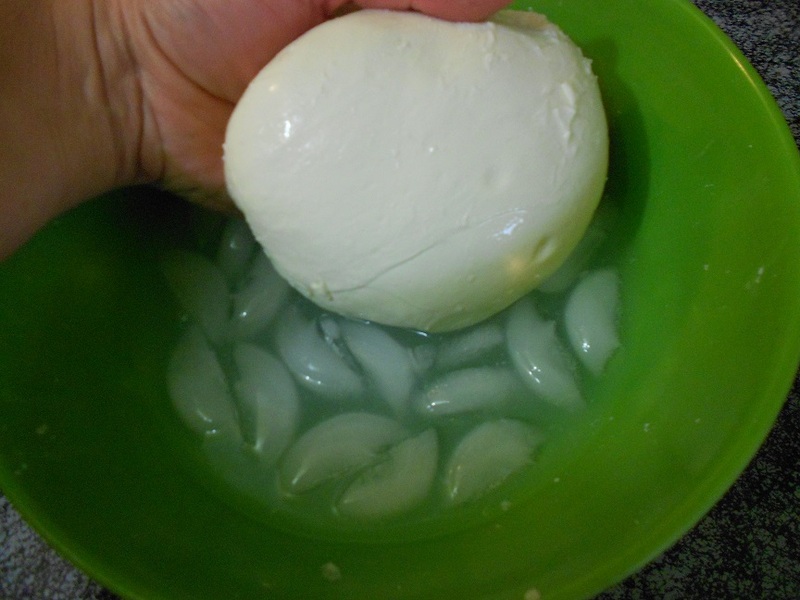 A note on fresh mozzarella: it does not melt the way aged cheese does. It gets soft and stretchy. I like to slice it into coins to adorn a pizza, or long slices for paninis. Or I’ll roll it into little balls and toss with pesto, then give it to my friends to impress them. And they are impressed. Mostly because they have no idea how easy it is. If you try this recipe, please give me your feedback. I’d love to see pictures, too, so I can post a cheesemaking gallery in the future. I love the comment about a picture of cheddar just to show off. Well done! Thank you! It looks like I need to visit your page and see what you have on there. 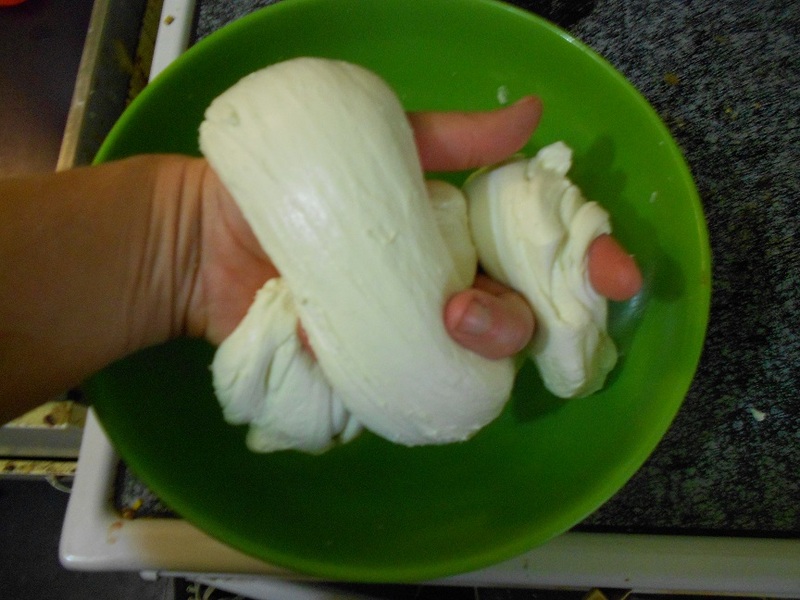 I have issues with making Mozzarella. I am 5 for 15 in the success column. So you won’t find much on that.. I would love to learn more about what you do involving cheese. It makes me wonder what causes the failures… if it’s the water where you live, or something else? Very curious. 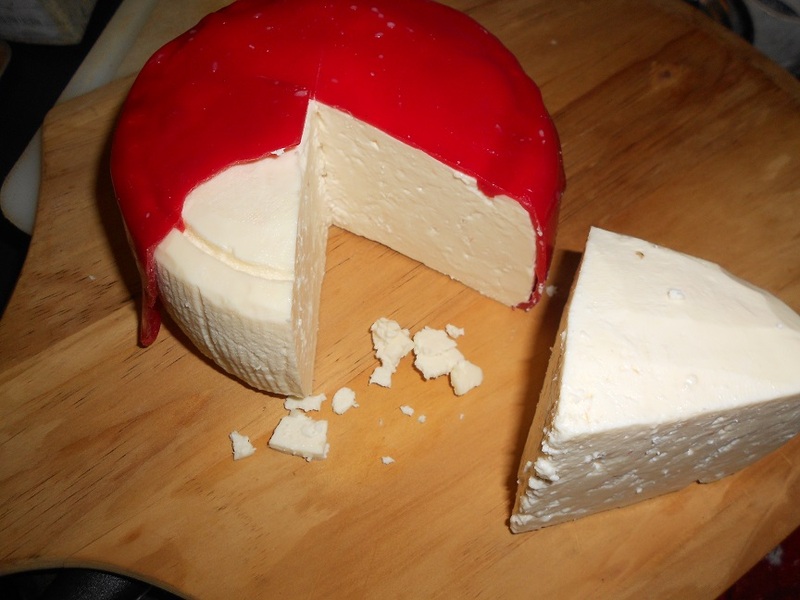 I’m just a single year into cheesemaking, and it’s not a full-time endeavor, so my experience is limited as well. I have a feeling with mozzarella it happens to be the kind of milk I have been buying. It is hard to find cream-line milk here without going to a speciality store. Raw Milk is out right illegal here, mind you the Creamery where I now work has a licences for Raw Milk Cheeses. I’ve isolated my problems with the Camembert so onwards and upwards. It is funny that the most issues I have are with “fresh” cheeses. Raw milk is illegal here, too. The only legal way around it is to do a “cow share.” I’ve tried making goat’s milk cheeses, but the main brand of goat’s milk here is ultra-pasteurized. I found a pasteurized kind at Trader Joe’s, but it’s almost $4 a pint. I made one batch of very expensive goat ricotta, which was fabulous, but it’s too costly to do regularly. Oh man, I am totally trying this out sometime! I would love to hear how it turns out! Thanks for stopping by. Thanks for stopping by my other blog! I’m going to have to try this, thanks for posting! I’d love to hear how it works out for you. Thanks for stopping by my blog!